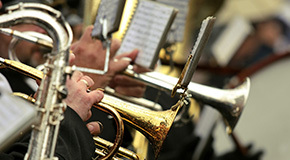 No matter if you are looking for sheet music for young band or traditional brass band: In our music catalog you will find a wide selection of genres from pop to polka with over 65,000 band music scores. From the blockbuster James Bond film 'Skyfall', pop sensation Adele has crafted a fitting theme to suit the mood. Skillfully arranged here for incomplete ensembles. The music of the popular band Coldplay continues to be an enduring force in the contemporary pop music scene. Here is a well-paced and great-sounding medley of their biggest hits. Featuring some of the best-known spy themes from the silver screen, here is a very playable medley of James Bond soundtrack favorites through the years. Whether polkas, overtures or party hits - as acknowledged specialists in wind orchestra literature, we stock over 65,000 titles from every style and publisher. Here you will find original compositions, reworks and arrangements with many sample scores and audio samples for wind orchestras, brass bands, marching bands, fanfare orchestras and flexible instrumental line-ups including with solo artists, vocals or choir.